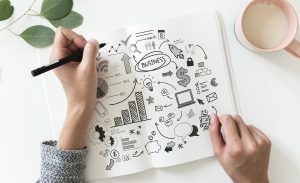 What is a business strategy and how do you stick to it? A business strategy is the plan and pathways that you are going to use to reach your long-term corporate objectives. The purpose of this is to give you and others within your organisation direction and the optimum chance for success by considering the resources, actions, timescales and targets. By paying more attention to your strategic planning and management, you will be able to achieve a tangible impact on your organisation. This is why we recommend further training in this area – Learn more here. Through a blend of contemporary theory, strategic analysis and practical application, you will apply your new skills to this challenge and end with an action plan for change. Why is strategic development important? In a rapidly evolving digital business environment, it’s not advised to cement your strategy too much. This will leave your business missing out or being left behind on key developments in technology as well as potentially leaving you open to backlash from other environmental factors. A good example of where this has recently happened is the introduction of mobile-friendly ranking algorithms on Google in 2015. Many referred to this event as “Mobilegeddon” and with good reason. Those who depended heavily on their websites and failed to make the changes necessary to optimise them for mobile devices lost rank, traffic and most horribly of all leads! Some of these websites are still fighting to get back to their position to this day. This cautionary tale is a lesson to those who do not pay attention to the changing business environment when thinking about their business strategy. You have been warned! But have you learned your lesson? One of the impending changes that will soon be affecting your business strategy will be Brexit. Have you looked into how this could impact your business and planned your strategy yet? Is there an opportunity within the changes that Brexit will bring that you can take advantage of? This is why a well-executed business strategy is essential for your business’s long-term survival. A strategy will help you to prepare for anything and increase your chances of success. So what are you waiting for? You can learn about how to do this effectively by seizing opportunities to expand your knowledge through education. Learn more about our advanced strategic management course here.